Leo peacefully passed away at Carman Memorial Hospital March 4, 2015 surrounded by his family. Survived by his loving wife of 61 years Noreen. Also survived by their six children Linda(Russ) Nicolajsen, Donna (Beat) Christen, Bob (Sonja) Allen, Janice (Bryan) McIntyre, Gordon (Arlene) Allen and Bill (Jennifer) Allen. Left to cherish Leo’s memory are 14 grandchildren and 16 great grandchildren. Leo was predeceased by three infant sisters, brother Lyall, sister in-law Kay, brother in-law Herb and grandson Kelly. He is survived by one brother Norman (Doris) Allen, two sisters Elinore Goldberg and Lorraine (John) Swark. Dad was born and raised on a farm in the McDermott district. After 27 years of single life dad met and married the love of his life Noreen Roberts. Together they started their lives grain farming, raising cattle, chickens and pigs. With all this plus a big garden they never went hungry. Dad drove a school bus for six years, also trapped and sold furs, fox, weasels, mink, rabbits even some skunks, badger and a lynx to supplement the income. In 1980 Dad and Mom sold their farm and moved into Carman. They retired and lived the GOOD life, traveling and wintering in BC. Finally in 2005 Dad and Mom moved into 5th Ave apts, which he enjoyed until his passing. As per Dads wishes, cremation has taken place and interment will take place in the spring. 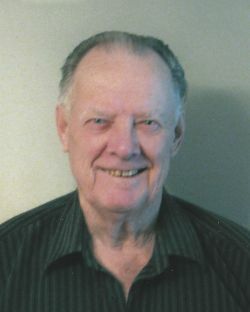 Funeral service took place on Friday, March 6, 2015 at 10:00 a.m. at Our Lady of Mount Carmel Catholic Church, Carman, MB with Father Richard Machura officiating. The family would greatly like to thank the staff at Carman Hospital for the wonderful care Dad and the whole family received while dad was a patient. Memorial donations may be made to the Carman Palliative Care, Box 610, Carman, MB, R0G 0J0.